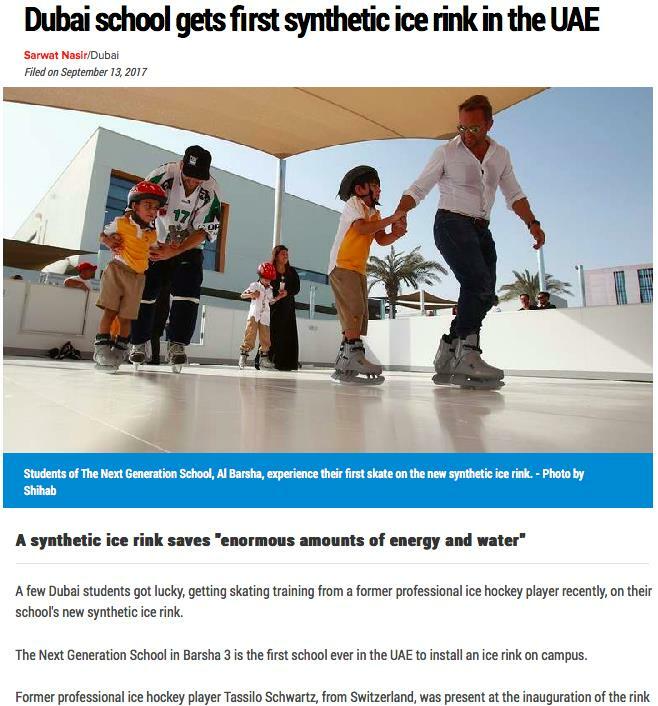 A few Dubai students got lucky, getting skating training from a former professional ice hockey player recently, on their school’s new synthetic ice rink. The Next Generation School in Barsha 3 is the first school ever in the UAE to install an ice rink on campus. Former professional ice hockey player Tassilo Schwartz, from Switzerland, was present at the inauguration of the rink on Wednesday. The product by a Swiss company called Glice and made out of complex molecular technology, the rink uses high quality polymers and other materials to create an artificial surface that looks like ice. “I wanted to try skating on the synthetic ice rink and was very surprised by the quality. It’s a really good alternative to real ice. Here in Dubai, it works perfectly. When I compare it to really professional and well-maintained ice, I would say the puck handle is in equal measure,” Schwartz said. The project director at the school, Tahir Farooq, said that the ice rink will help students develop an interest in sports and also learn about protecting the environment. The rink does not require any water or energy consumption, as it is not real ice. The school, which runs from KG to Year 6, places a strong focus on sports, offering roller-skating, martial arts, tennis, swimming, gymnastics and ping pong. There are seven electives offered to students during school hours, where they can pick any of these sports based on their preference and talent, as well as non-sport electives such as arts and robotics. “One of the things we look forward to is enhancing the experience for children. Sports is a great way to do this. When kids are happy, they are excited to be in school and this helps with their academics as well,” Farooq said. The rink will be available to the parents as well, who can try it out in the after-school hours. A synthetic ice rink saves “enormous amounts of energy and water”, according to the founder of Glice, Viktor Meier. Every square metre of real ice uses the same amount of energy an entire apartment would use, he said. Their synthetic ice rink at The Next Generation School is measured at 200 square metres and if that were made of real ice, it would use up the equivalent of energy used to power 200 homes. “With this solution, we can provide ice skating to everyone without harming the environment,” he said. “The cost of installing a synthetic ice rink is 30 per cent less than installing a real one. This is the first synthetic ice rink Glice has installed in the UAE, after having done so in over 70 other countries. They also cater to individual clients who want it for personal use. One client in Hawaii, he recalls, wanted a rink in his backyard so his figure-skater daughter could use one at her convenience.